A friend was looking for an easy pasta dish to extend her family meal repertoire. Her daughter loves pasta and meatballs and so I thought to write up my recipe and share it with her. 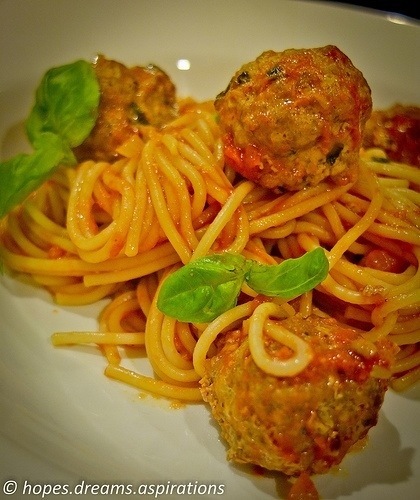 If you don’t have time to prepare the meatballs, you can easily use the mince to make a spaghetti bolognese instead. Just omit the egg and panko crumbs while marinating, and fry off the meat after the shallots and onions. In a large bowl, mix the minced meat, egg, tomato paste, light soy sauce, sugar, diced shallots and herbs together. Using a small spoon, shape the meat into small balls and place in an oven proof dish. You will have about 30-40 small balls. This can be prepared night before. In a frying pan, gently sauté onions and shallots in the olive oil until soft. Add chili flakes and red wine, let it simmer for about 2 minutes. Add the tomatoes and purée and let it bring up to the boil. Reduce the heat and let it simmer for 15-20 minutes to reduce. Stir occasionally to avoid it catching on the bottom of the pan. Taste it while the sauce is cooking – trust your taste buds and add a bit of brown sugar if it tastes too sour for your liking. While the sauce is cooking, put the dish of meatballs into the oven and bake for 15 minutes or till juices run clear. By all means try a piece. At the same time, put water into a large pot and bring it to the boil. Add the pasta in and add 1 tsp of salt. Cook it till al dente, about 10-12 minutes. Test it close to the 10 minute mark as I find my kind of al dente might be different to yours and I certainly don’t always follow the suggested times in the packet 100%. Drain pasta and add to the sauce. Add the meatballs to the pan, mix well and serve with freshly grated pecorino cheese (optional) and freshly picked basil leaves.